Disclosure: I received a review copy via the publisher on Netgalley in exchange for an honest review. "Common sense told me I should be afraid of anything that provoked this much anxiety in my mother, but as usual I felt the opposite. My curiosity skyrocketed, and for the first time, I envisioned myself solving the mystery, saving the day, being the hero." 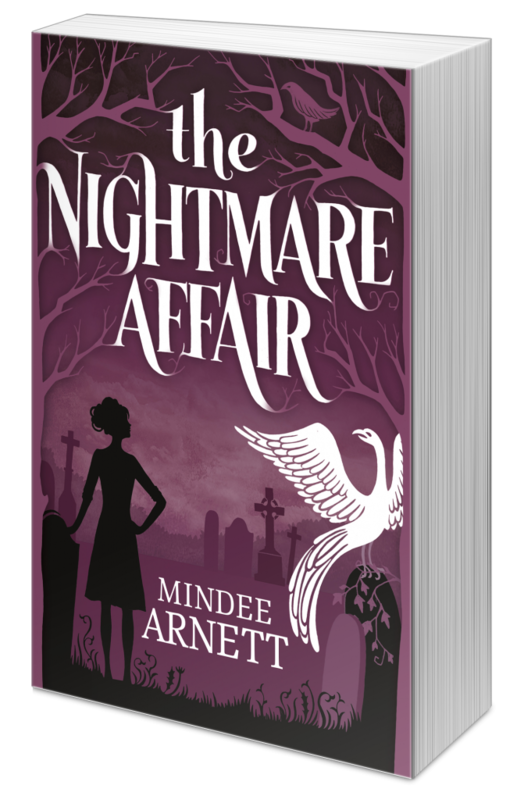 I was really happy to read The Nightmare Affair because the idea of boarding schools, murder and paranormal entities gets me all sorts of excited. I sort of figured that this would be a cross between The Raven Boys and Harry Potter and for the most part, it was. But while Arkwell Academy is like Hogwarts for all manner of paranormal beings, the book lacked that certain mystical aura that Rowling and Stiefvater both managed to create in their series. It's not to say I didn't get a kick out of the book, because I did, I guess I was just hoping for something with a little more oomph. What I liked most about this book was the overall concept and the fact that Arnett was not afraid to go to a darker place with it. The murders were gruesome (to a point) and the action was weirdly suspensful. Arnett manages to blend reality and magic in a fairly seamless way so that the reader is able to get a clear vision of world she's created. She takes liberties in using just about every mythical creature you could want or need, from sirens to witches to fairies and oracles. She even took a gamble in making nightmares a magical being--- one that paid off. Her world-building is a lot of fun, especially the part where inanimate objects take on a life of their own and develop their own interesting (or bitey) personalities. But where I think the world-building excelled, there were some parts about how the magic worked in this world (like, The Will) that could've been a bit more clear. Generally speaking, I liked most of the characters though I found many of the secondary ones to be more interesting than the leading lady. While Dusty has her funny moments, I didn't really identify with her. She's lead on easily by others and doesn't really stick to her guns. I wanted so much for her to be stronger and more self-assured. She falls prey to the dreaded insta-love/love triangle thing and lets it get in the way of her common sense far too often. I did, however, admire the bond between her and her BFF/roomie, Selene. And Selene is someone I could totally get down with. Somewhat hyper-feminist, smart and tough, she's a character I wanted more of. As far as Dusty's love interests go, Eli was your typical tough-guy-with-a-soft-heart and Paul the attractive nerdy dude. What I wish we saw more of was the head-to-head banter between Paul and Eli as they vied for Dusty's affections because that was some entertaining stuff! I think my biggest issue with the book, though, was that the big twist at the end could have been stronger. It was frustrating because Dusty didn't pick up on all the obvious hints throughout and by the end, I was a little let down. It's disappointing when you guess who the bad guy is and, in this case, what type of creature they are before the intended reveal. But overall, I really did think The Nightmare Affair was an enjoyable albeit predictable book with a solid plot and some serious series potential. The Nightmare Affair is a fun, magical read that will capture the imagination with its superb world-building despite its other flaws. I wouldn't say the characterization was the greatest but the characters are entertaining enough to keep the reader intrigued. I loved the darker plotlines and think the book will do well with a younger audience. I'm interested to see what else Arnett has to offer with this series. Once I get a break in my already long reading list I may have to check this one out. I'm like you though, and it can be disappointing when you know the twist or the surprise ending in advance. I like to be shocked. Agreed, Kay. It was a great concept with likeable characters and fantastic world-building, only the predictability kept it from really packing that wow factor that I was looking for. Overall, this sounds like a good one. I like the premise and how interesting that she's an actual nightmare. And I enjoy good world building too. Great review!